4 How to Install Pre-Cut Window Tint? 5.1 What Do I Use to Safely Clean Tinted Windows? 5.2 What Causes Window Tints to Turn Purple and Bubble? 5.3 How Durable is Window Tint? Window tinting is a common way of customizing your vehicle by applying different color and style polyester foils or film on glass surfaces (windshield, side windows, and rear glass) of your car. However, window tinting is not just aesthetics thing since it also helps to protect the interior of your car from sunlight, lowering your temperature inside and gives you the higher level of privacy which can be important in some cases. Besides the aftermarket window tinting kits that are available, most manufacturers offer a factory window tinting. It is a different process but serves the same purpose and usability. The important thing to know is that quality aftermarket product or factory tinting does not limit your visibility from inside the car. It just limits the amount of sunlight going in and gives a higher level of privacy for you and your passengers. Follow out guides to the world of window tinting and product reviews and find the best window tint for you. 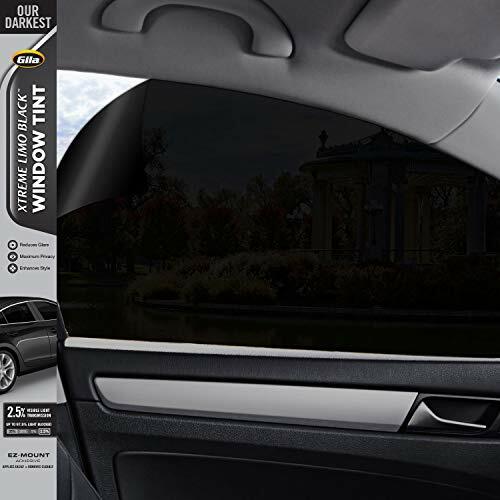 With 35 % VLT, this is medium shade window tint legal enough for most states and countries but still dark enough to give a decent sun, heat protection, and privacy. It comes in a very basic package with cutter and piece of hard plastic to squeeze the water during installation. It isn’t pre-cut so you have to shape it to your needs. Even though the foil looks black when you buy it the true color is dark purple so this means it isn’t that good in reflecting UV rays. The heat resistance is solid and durability is average. 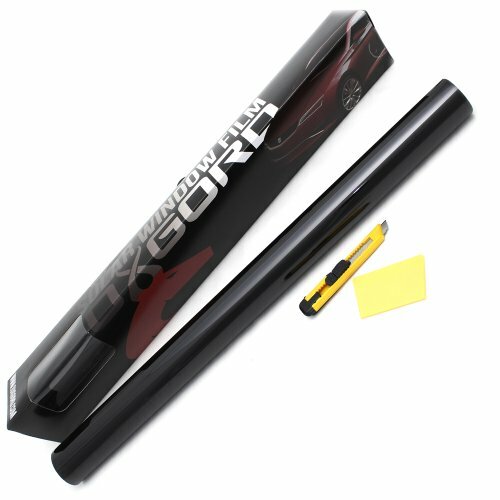 Despite the really affordable price and almost 10 ft of the length of the foil, we wouldn’t recommend this product for car use since it is prone to changing color and it isn’t that good in stopping UV rays. It can be used in other applications and its medium shade characteristic is good for various other uses. Besides that, the 35 % VLT is still too high for some local laws. Affordable and universal, Black Magic Jumbo 5% is an interesting option for not only automobile users but also for tinting of house glass and other similar applications. This is not pre-cut tinting foil it is just a roll of film which you have to cut yourself in order to fit on glass surfaces. With just 5% VLT index this is a very very dark film and users should be advised that in most countries and states having this dark tint on your car is not legal. As similar products on the market, Black Magic Jumbo 5% holds instantly by static cling and no glue is required. The top layer of the film is scratch-resistant and its UW protection and heat resisting are average. However, if you chose this product you must know that you shouldn’t use it on thermal, double-paned windows, plastic, acrylic or Plexiglas, just on regular glass. At the same time, users reported some problems with the foil on moving side windows in cars and after a while, the foil started to peel off so you are best off if you use this product on the nonmoving glass like the rear window on a car. The Gila Heat Shield 35% is a more advanced product on the market designed especially for car use. It has VLT index of 35% which is considered medium dark tint and it comes in few different and affordable priced packages. This product is made with deep-dyed technology and manufacturer gives a two-year limited warranty. Due to the quality of the product, there are no problems with film turning purple after installing and every Gila Heat Shield 35 % will reject up to 61 % UV rays. This film is also scratch resistant. Same as the other similar product, you can install this foil by yourself, however, we recommend going to the professionals with experience. The only potential problem with this product can be if mounted on heavily curved or domed rear windows found on many modern cars since it can cause peeling due to a difficult surface. The solution is Gila’s rear window kits (sold separately) which are specially made just for this purpose. Other than that, there are no problems with this window tint and it is a decent product for a decent price with good specifications and reputation. This product is available with 5 different shades of tint, starting from 50% to the 5% VLT index. The manufacturer is proud to announce 99% anti-UV rate which means that this foil has good heat reducing abilities. 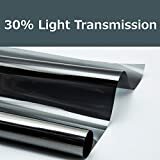 This is not a metalized window film type of tint so it doesn’t reflect light which is good to know and it is a regular foil for cars and home glass. However, there is a slight mirror effect. The quality of the material is good and it doesn’t turn purple after a while and basic color is dark gray almost black which is perfect for most users. Users reported perfect fit for flat glass surfaces but on some more demanding glass parts, there could be problems with adhesion of the foil. It isn’t pre-cut so you have to cut it yourself and it is best to use an application kit which is available from the same seller. The quality of the product’s polyester formula is better than average and since it comes in few different VLT indexes at the affordable price it is one of the best foils on the market for amateur users and car and home applications. The Gila 2.5 VLT is probably the darkest window tint foil available on the market today. The common lowest VLT index is 5% and this is 2.5% which means it is almost fully nontransparent and you can not see inside of the car in any conditions. 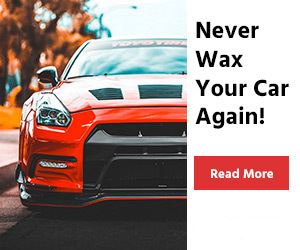 In a majority of areas, this extreme window tint is not legal for side windows and windshield and it can only be used for rear side glass or rear glass on selected models of cars. This level of tinting is only found on limousines and similar professional vehicles where privacy is a must. 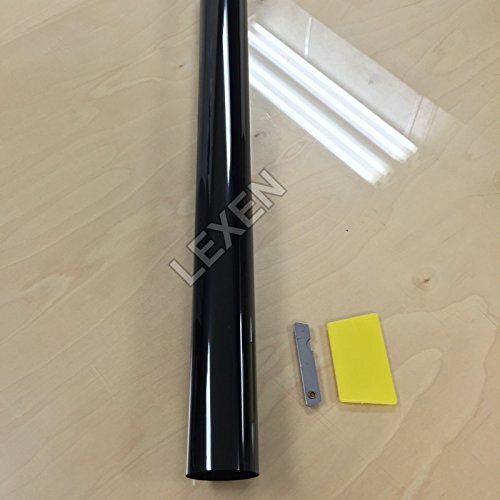 The foil itself is good quality, a deep-dyed type with high heat and UV rejection rate (97 %). The manufacturer is a well-known company which has the quality product and two-year limited warranty on all of its tints. 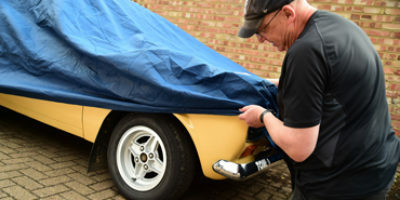 The length of the foil is little bit shorter than similar offerings on the market but it is enough to cover two side windows of average car or truck and one big glass window in house. The price is affordable and you can not go wrong with Gila product but first, check if tint foil this dark is legal in your area. The OxGord window tint foil comes with three regular VLT index size (20,35 and 50% VLT) and it is not pre-cut, same as other product that we feature. It is also slightly shorter than other foils but still long enough to tint average size side glass on a car. It uses the same type of installation routine and comes in a package with a scalpel and piece of hard plastic for squeezing the water and air beneath the foil. As ever, we suggest that you seek the help of a professional window tint expert for best results and perfect fit. Even though it isn’t a metalized window film type it has a slight metallic look which is good to UV and heat rejection and can look stylish on your car. The foil is peel-proof and will not turn purple after some time and you can use it on car windows as well as on home glass and other places. Solid quality, three index sizes and affordable price make OxGord tint foil a good proposal but the short length could mean that you need two packs for covering all your side windows or bigger surfaces. As a popular option in car customization process, various window tints kits are available on the market. Of course, there are a lot of differences between products and first of all you have to choose what kind of tint you want, is it legal in your country or state and what kind of effect you want to have. If you spend much time driving, especially in a warm and sunny climate, window tints are almost necessary because the sun can shine directly in your face and constant exposure to UW rays can cause interior to crack and fade. On the other hand, window tints are essential if you need a higher level of privacy for you and your passengers and you want to give your car a fresh look. Here are a few important tips for choosing the best window tint for you. 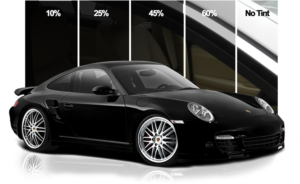 First, you have to decide how much money you want to spend on window tinting of your car. There are both cheap and expensive options on the market and you must know that cheap window tints do not do the job properly and they are prone to peeling and fading. If you want full UW protection for your can which will last, you must go for more expensive options and get the best value for your money. If you, for any reason, really need window tint on your car do not try to save money and go for best on the market. Of course, you can install window tint kit on your car and there are a lot of DIY products on the market but we wouldn’t recommend that. Installing can be tricky and if you are not highly experienced it would certainly end in disaster and ruining your tint kit and maybe even your car glass. It is best to go to a specialized shop and let the professionals with adequate tools deal with it. You’ll pay a little more but you’ll get a perfect installation and shop warranty which is important. Since the early 90’s when first polyester window tints become available on the market, they become the subject of ever-changing traffic laws all around the world. Practically every country and state have different laws regarding window tinting. Most of the countries allow the window tints only on the rear glass but not on the windshield or specific percentage of tinting so you must be aware of laws in your country. It is wise to ask before buying and installing just to be sure that your vehicle will be safe in traffic and you won’t get any tickets. Since there is a lot of products with different specifications it is best to learn a thing or two about tints. If you need tint for reflecting sun rays and keeping your car cool during the summer, search for the product with heat protection feature. If you want a tint for privacy reasons, look for products with a darker color and smaller VLT (visible light transmission) index, since the smaller the VLT number is the less it can be seen through the glass from outside. Learning and understanding of the product specifications will help you chose exact tint for you and ensure that you met your expectations after installing and during the use. There are two main types of window tinting available on vehicles. 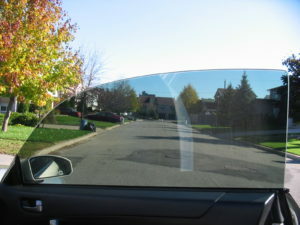 One is factory window tint which is the special process done by the manufacturer in order to get a darker shade of glass right from the factory and other is aftermarket window tinting done either by buying and installing pre-cut window foils for your car or custom cutting and fitting done by professional car shop. The most important thing about all window tints is VLT (visible light transmission) index and it measures the amount of light percentage of light that passes through your windows. The lower the VLT index the darker the glasses are ordinary clear windows have 100 % VLT while the darkest tint available has just 5 % VLT. 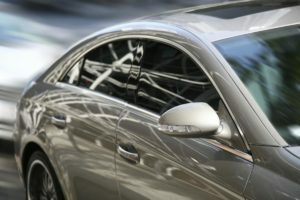 Most window tints available on the market goes between 20 – 70 % VLT. 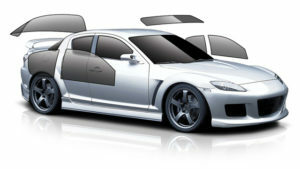 Most car companies today produce models which are available with various levels of factory window tinting. However, the process is totally different than aftermarket since the glass is not wrapped in foil but colored during the making of the windows giving it a permanent tint. The inside of the glass is colored by darkened pigment during a manufacturing process called “ deep dipping“. The pigment gives a glass a darker tint but does not provide significant UV protection or heat rejection like aftermarket window tint foils. The average VLT index for factory tinted windows is 15 % – 26 % which is enough to give you a cool look but not to fully protect you from the sun or give you a high level of privacy. Due to strict laws in some countries, you can only have factory tints on your car, not aftermarket ones so if you live in such a place, the factory tint is the only way to go. Since the early 90’s there is an enormous aftermarket for tinting foils. Development of the polyester and similar materials really helped window tinting fans to create various products for all kinds of applications. There are few basic types of aftermarket window tinting foils and those are Dyed Window film, Metalized Window film, Hybrid Tinting film and Ceramic film. A dyed window is the darkest type of foil blocking most of the light coming inside of the car and it is nonreflective which gives it a cool look. Metalized window film is interesting since it reflects light and could be ordered in a mirror-like finish and it also blocks a lot of light however it could be too much for some owners because it can look too shiny. 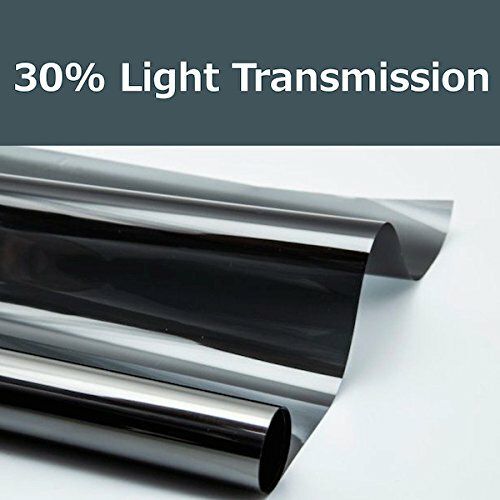 Hybrid tinting foil is the combination of the previous two and it gives good protection and durability with a slight metallic look and it is also more expensive. Ceramic film is the newest addition and uses new technology and ceramic compound formula. It is durable and effective in blocking heat and the sun but it is the most expensive of them all and requires professional installation. The darker colored (mostly black or dark gray) window tints are most common but for users that want a little more color on their cars or they are building a special project, there is a selection of colors available. Basically, you can find window tints in any color you like and this kind of foils are often seen on show cars or tuning cars. How to Install Pre-Cut Window Tint? Before we start with the tips on how to install window tint by yourself, we must recommend you got to the professionals and get it done by experienced people with the right tools. However, if you feeling confident enough and want to try tinting the windows by yourself, here are a few simple tips on how to do it properly. Beside window tint kit you have bought previously which is pre-cut for use on specific make and model, you need a few simple tools you can find in any household. You need a sharp knife (razor blade or scalpel), hard piece of plastic for squeezing liquid and air beneath the foil, spray bottle filled with detergent or another kind of washing fluid, clean cloth without lights, hot air gun or strong hair dryer and some talcum powder. The first step is a thorough cleaning of the glass surface before you apply the pre-cut window tint. The glass must be fully cleaned and without any dirt, dust particles or anything that can be trapped beneath the foil and ruin the perfect look of the window. For that use, the spray bottle filled with the detergent and wash the glass. After that use the cloth without lines to dry it. After that, the glass should be perfectly clean and use a slightly damp cloth to put a line of water, horizontally across the center of the window. When you put your pre-cut piece of foil on the glass surface, use the piece hard plastic to squeeze out the water and air trapped in between the glass and the tint foil. Do it slowly and from the center of the glass to the sides. After that, all the air or water should be out and the foil is firmly and evenly glued to the glass. Be thorough and meticulous with every little bubble of air in order to get the best results. After three first steps, foil should be in the place, glued to the glass but it should be a little bit crinkled and not ideal. Don’t worry about that because this is when hot air gun or hair dryer comes in place. Use it to warm the foil and press it with a piece of hard plastic so it fits perfectly to the surface of the glass and dimensions of the window. Take your time and do it slowly and carefully so you do not overheat the foil in which case it could wrinkle and you could ruin your work. After that, window tint should be perfectly glued to the glass without any imperfections or bubbles. After successful installation of window tint foil, you should avoid opening your windows or pressure washing your car for a few days and search for manufacturers recommendations and guidelines. By avoiding this you will give your foil enough time to fully bond with the glass and be resistant to future use and washing. What Do I Use to Safely Clean Tinted Windows? The cleaning procedure when you have tinted windows on your car depends on what kind of tinting you got and what type of foil is on your windows. If you got a regular factory tinted windows, there is nothing to know since those windows have no foil or film on them and can be treated the same as other glass. However, if you got windows with applied tint foil we recommend you to be extra careful when washing and cleaning your car. Do not use high pressured water to clean your windows since it could peel off the edge of the foil or even the whole film. Be gentle with washing and use a very soft cloth or sponge because you can scratch the foil and cause ugly damage. Do not rub your windows too hard since it can cause the foil to lose its gloss finish and UV rejection capabilities. What Causes Window Tints to Turn Purple and Bubble? The answer to the question of what causes window tints to turn purple is quite a simple one. Sun rays and age of the foil. Since the foil is exposed directly to the sunlight it takes a lot of UV rays and heat exposure. The deep-dyed foils are especially prone to the “purple effect“ since their chemical formula is not as good as some of the most expensive options like (metallic or ceramic foils). Years of exposure to sunlight will turn every deep dyed foil purple but you can avoid that by choosing the better and pricier offerings. Bubble effect on window tint foil is also caused by the sun but bubbling appears only if the tint is not installed properly. During the installation, it is very important to clear all water and air bubbles between the glass and the film. If you do not do it fully after some period of use, the sun will heat the small amounts of air and water which are trapped inside causing them to form bubbles and ruin your perfect looking window tint. If you ignore bubbling of your tint, over time sun will cause those bubbles to crack and you will have very ugly looking windows. That is one of the reasons why we suggest you go to the experienced professionals for your window tint foil installation. If you install your window tint following manufacturer inputs or use professional help, chose an upscale quality product and take special care when washing and cleaning, the window tint foil should last for years and years. Modern products with higher quality and advanced polyester, metallic or ceramic formulas are very durable and can sustain long periods of use. If you follow our advice, you will find the ideal option for you and avoid common mistakes so you can enjoy sun protected driving in the privacy of tinted windows. Ever since window tinting was introduced the traffic and automotive laws were on to it trying to declare window tinting unsafe and dangerous in everyday traffic. 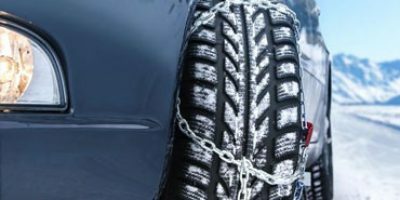 The biggest concern was visibility and at first, it was thought that the driver cannot see properly during the night and that can cause accidents. However, during the years, popularity od the window tinting rose and governments realized that is not unsafe and dangerous but it should be regulated by law. This is why today almost every country or state in the world has different laws about tinting. In the USA for example, every state has different propositions and one tint can be legal in one state but illegal over the state lines making you potential ticket holder. Most of the countries in the world allow window tinting but only on side windows or rear window and in the mid-VLT range (75-50%). In some areas, window tinting is only permitted for government vehicles, presidential motorcade, and similar cars and not available to common citizens. However, if the car is equipped with factory tinting it is legal in every country. So be very concerned about this window tinting laws because it can cause you lot of potential problems, not only paying the ticket but you could be banned from using your car until you take down your window foil or even banned from entering some areas with very strict traffic laws. In some countries with high crime rate where police presence is needed, window tints are forbidden since police can not see who is driving the car. To this day there is no global law on window tinting and you should really learn about local laws and the laws of the country you going to travel by car before you decide to tint your windows. You may also want to buy a windshield sunshade to keep the interior cooler! and also don’t forget to check out higher quality Steering Wheel Covers! Not just a stylish addition to exterior your car, window tints are a popular way of keeping sun and heat away from your interior. 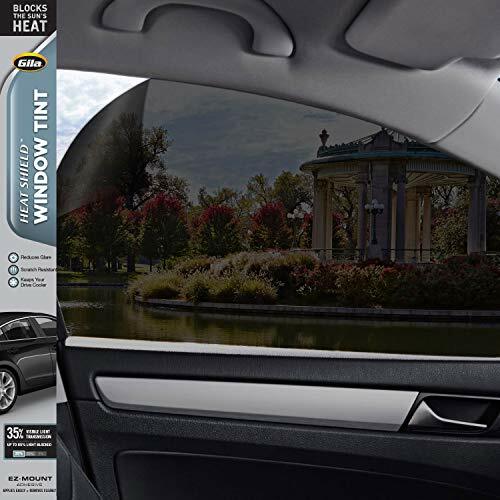 There are a wide variety of colors and specifications available on the market and most of the products in the window tint reviews are affordable and easy to use and install. However, car window tinting is the subject of various different laws and you have to be aware of that before you install a window tint on your vehicle. Follow our introduction and guidelines and find the best window tint for you.